Hos Dorte: Feeling Blue.... DT card for HM&FMC. Feeling Blue.... DT card for HM&FMC. you a brand new challenge. Could you imagine a better way of starting a new week?? Interpret as the colour blue or unwell/sad! so I went for a card with the colour blue. The papers are a mix of Bo Bunny and Little Yellow Bicycle, correct me if I'm wrong. sent to me from a lovely crafting friend. I think it's a Memory Box die. The tag with the sayings about babies, is made with a Magnolia die. Binding coloured with Distress Reinks. Well here is my usual back side with my personal stamp. I have used sketch # 68 from Papertake Weekly. take a look at this amazing sponsorship line-up... WOW! 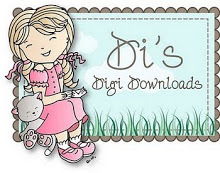 The Official Site of House-Mouse and Friends!! good for shopping at HMD's online store. 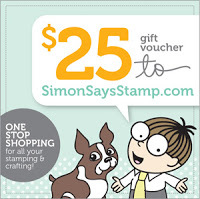 ONE lucky winner will receive a $25 gift voucher to shop at Simon Says Stamp store. 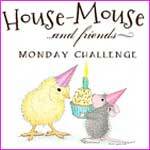 House Mouse & Friends Monday Challenge this time. Don't forget to check out the rest of my teamies fabby creations. Awesome card with pretty papers, Dorte...great colouring and I love that frame die! Øj, hvor er det sødt. Og sikke smuk farve. Din die (fra Memorybox) er jeg totalt vild med. Sikke en gave at få. 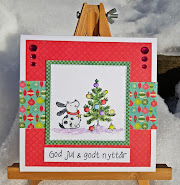 beautiful card and a great die you have used Dorte. Dorte, what a sweet little stamp for a new sweet little boy. Such a beautiful card, that die is wonderful too. Pretty papers. New Mom is going to love receiving this card celebrating the birth of her little guy. What an adorable image Dorte, I love your feeling blue creation, totally gorgeous. This card is just gorgeous, soft and sweet all at the same time. I LOVE that die you used. I've got to get that one. Thanks for the inspiration. Ab adorable card Dorte, I love your colour scheme and such pretty papers. This little image is so sweet and wonderful details!! Simply precious! They will love it, darling oval and flowers for this baby. Awww this is so cute Dorte! 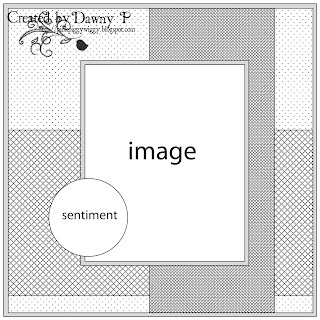 I love that sweet image and your beautiful colors... perfect baby boy card! Thanks for joining us at Crafty Calender this month! Super sodt kort Dorte. Laekre farver og sode smaa detaljer. Bare saa sodt. This is so gorgeous. Beautiful blues and beautiful dies used. This is a lovely card, such beautiful papers and adorable image. Your verse is fabulous and I love your little pram charm. Thank you for making me feel so welcome whilst I am a guest designer at the House Mouse & Friends Monday Challenge. Aw super cute HM image Dorte lovely design & colours so sweet..